A team of artists are using improvisation and augmented reality to create a different science fiction play every night for 13 days. Thirteen Cycles is currently underway at the Rosemary Branch Theatre in London, with the final show taking place on November 29. 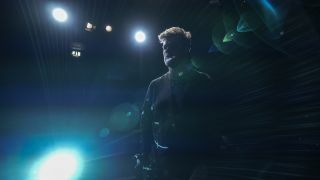 For each performance, creators Katy Schutte and Chris Mead create a full 'movie' on stage, with an improvised soundtrack created by Fred Deakin of electronic music duo Lemon Jelly. The play's set uses projection-mapped interactive visuals, ensuring a different look on stage every night. Each performance is digitally recorded, with daily trailers featuring footage from the previous night's show. Thirteen Cycles can vary hugely - from subtle psychological dramas in the vein of Solaris to grand performances on the scale of Star Wars. In addition to his work with Lemon Jelly, Deakin formed web design studio Airside in 1998 and is now professor of digital arts at the University of the Arts London. He has also written a science fiction rock opera, The Last, scheduled for release later this year. Schutte and Mead have many years' experience in improvisational theater, serving as co-artistic directors of The Maydays and The Nursery Theatre respectively. After the success of Thirteen Cycles, they plan to take the Thirteen Cycles format on an extensive tour in 2019.